It was shortly after having my first child that I discovered one of my favorite baby products – the Halo SleepSack! Now, with baby #2 here (already 3 months old I might ad) my Halo SleepSack’s are my go to sleepwear for her. It is very important for babies not to sleep with any blankets. So, instead Halo SleepSacks are wearable blankets that are first off, safe for babies to sleep on and secondly they keep them warm. 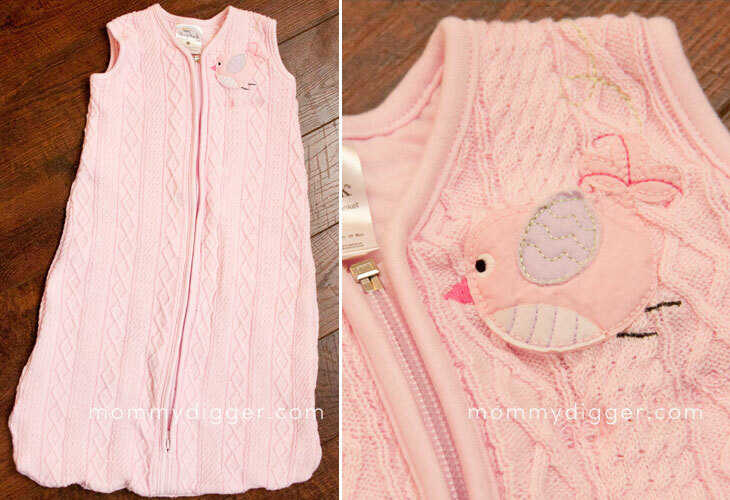 Delaney recently received a HALO Cotton Cable Sweater Knit SleepSack Wearable Blanket to try. The HALO Cable Sweater SleepSack comes in pink, blue and cream. It has an adorable little embroidered bird applique on the chest with the the HALO signature “Back is Best”. The cotton cable knit is not only super cute but it’s very soft. It’s a lighter fabric making it perfect for the crisp spring, summer and fall months. To prevent overheating all HALO SleepSacks are sleeveless so I just pair them with a simple onesie or a sleep and play depending on the temperature. It has plenty of room for Loo Loo to kick around and diaper changing is easy because it zips from the top down meaning I don’t have to completely undress her for a simple diaper change. Experts recommend HALO SleepSacks as part of a safe sleeping atmosphere for babies. In fact, Halo SleepSack is the #1 choice of hospitals, We even were given one while we were at the hospital with both girls. HALO also offers SleepSack Swaddle Blankets if you have a little one that likes to be swaddled. Buy It :Visit the HALO website to check out all of the great safe sleep blankets. Win It: We’re giving one away for the Mother’s Day Gift Ideas event. Enter here.